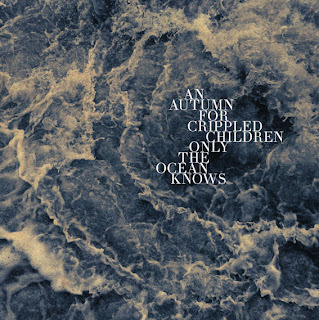 WYRD'S FLIGHT by Alex Mysteerie: Album Review: An autumn for Crippled Children "Only the Ocean Knows"
Album Review: An autumn for Crippled Children "Only the Ocean Knows"
Would there be a better suited label for this incredible Dutch project? Hardly! The name A Sad Sadness Song nails the sound of this band: pure melancholia and misery gushing into soaring, overwhelming passion transcending into blazing beauty. I got to know this band only from their second output, “Everything”. It simply blew me away and became one of my favorites of last year; I then sought out their debut “Lost”, which was equally haunting, although lacked that outstanding elating quality that characterizes the more mature sound. AAfCC’s name choice (once you get used to it) conjures up something unpalatable and unspeakable. Their older song “I beg thee not to spare me” makes me think of the sad times when, seeing a being caught in the inexorable, painful grip of a terminal illness, I thought without guilt: “This is no longer a life worth living”. The right to die with dignity is something we should all be granted by law. The band writes about personal experiences that have had a strong, negative impact on their lives, so the emotion that imbues their music is palpably real: in his (very spartan) interviews MXM reiterates how sometimes the intensity during the writing process becomes almost unbearable… I can see that; it is certainly easier for us to listen to the finished product after it has been pushed into an abstract dimension and embellished with its airy, majestic layers that transform each and every song into a powerful pair of wings. The rock (even brooding pop) influence, especially of the 80s and 90s is very audible, lurking through fluctuating, mysterious dark veils agitated by the perennial rain-swollen Dutch winds. This is why listening to AAfCC is both a strange yet familiar experience glowing with the riches of the past. There is a wonderful, reassuring warmth to this stormy music, since their unique way to express the darkest, most desperate human passions, from Everything to this new album, represents the ineffable dichotomy of life: pain/ugliness can be beautiful, that these artists catch this profound vision without sparing anybody’s feelings. “Only the Ocean Knows” is a poignant and evocative album title, which for some will sound pretentious: this is a critique that artists who want to let themselves go completely in the sea of pure emotion will inevitably face. However, those who value the importance and the bravery that such kind of exploration entails will know that this is simply irrelevant. Passion is just what it is: immense, untamable, and it has to be allowed to gush through freely to capture its honesty to the very last drop. Song titles suggest a melancholy sensibility to the surrounding landscape and weather, like “This garden, These Trees” or “The first snow this year”, but every track, even the most fragile and atmospheric, is always draped in majesty and beauty. It is the utterly unreal opener, “Past Tense”, which steals the show on a massive scale on this album. Each time I play it I find it hard to believe: it’s certainly one of the most elating dark-wave/dance/black metal tracks I have ever heard! The sweeping tones of the sky-reaching keyboards sound just incredible: cosmic in a completely unknown way… Only the outstanding album “Wish” by Australian electro/BM act Germ has shown me similar glimpses of genius-like brilliance! This raw, radiation-filled, almost alien jewel would have been a masterpiece if the guys had given it a proper epilogue. But it seems that most of their tracks tend to end abruptly and unceremoniously, leaving behind them no trail of debris; instead they evaporate instantly and cruelly like a fragile, ghostly entity hit by the first sun-ray at dawn. “Past Tense” also seems to represent the ethos of the band, which makes no secret of the fact that it reveres the old classics far more than the contemporary stuff, mentioning old Anathema, My Dying Bride, Emperor and Satyricon as their main influences, as well as a host of different rock stuff. An album that begins with a glowing blaze in the night-sky reaches a new apex with difficulty, and this is the fate of this new release by the Dutch band. The rest of the songs do flow beautifully but they will not take you by surprise. This does not mean they will disappoint. They will bleed your soul, barely keeping you afloat from drowning in the stormy waters that the suggestive cover offers as a backdrop to an emotional journey that draws few comparisons (perhaps some Drudkh, albeit in a different kind of way): a metaphorical grey, melancholy ocean made of all the tears from the hurt, the forgotten, the tortured, the unseemly. Out on 28th September 2012 on A Sad Sadness Song/ATMF.